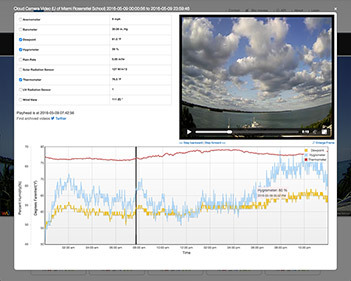 WeatherSTEM started as an educational project with the goal of enabling teachers to use live, real-world weather data in their math and science teachings. We have since created well over 100 weather lessons aligned to national science standards. We have also created a standalone high school meteorology course. WeatherSTEM has a small, hard-working team of curriculum developers that are passionate about creating interesting, engaging, aesthetically beautiful weather lessons for people of all ages. The lessons are aligned with national science standards and contain lively videos, photography, and charts. The coolest part of our lessons is that they are able to load live data and images from WeatherSTEM units across our network! No matter where you live, you likely live in a state that has its share of weather-related challenges and hazards. In most states, weather is the primary factor in the most significant industries including tourism, agriculture, and shipping. Shouldn't students in your state be amongst the most weather literate citizens? 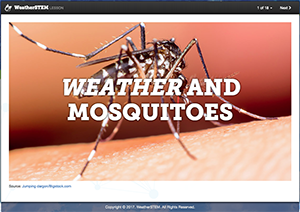 With WeatherSTEM's full-year high school-level Meteorology course, your students will be able to be just that. The course was built from the ground-up by a team of Meteorologists, graphic designers, and science education experts. The class is as beautifully designed as it is educational and your students and teachers will love it. 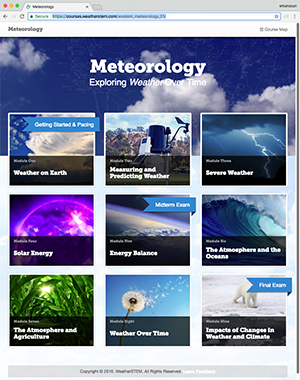 In addition to our core focus of building literacy in the subject of Meteorology, WeatherSTEM wants to help students become more data literate. To address this objective, we have created a "Data Mining" tool that lets students easily sift through literally billions of weather records and images gathered across our network. The data can be exported to many different formats including Excel, JSON, and XML. It can also be graphed online in the browser. The job market your students will enter will put a premium on big data comprehension and competency. WeatherSTEM will prepare them for success.